To fulfill UMAP’s mission of enhancing international understanding by boosting student mobility between UMAP member countries. To offer students opportunities to learn about the cultures, environment, and society of Taiwan in English. To encourage students to be socially aware, active global citizens through engagement and participation in discovery camp activities. UMAP Discovery Camp 2019 consists of two major components: (1) the economy; and (2) society/culture. The economic component includes three lectures which discuss Taiwan’s past economic achievements, current challenges, and future prospects. 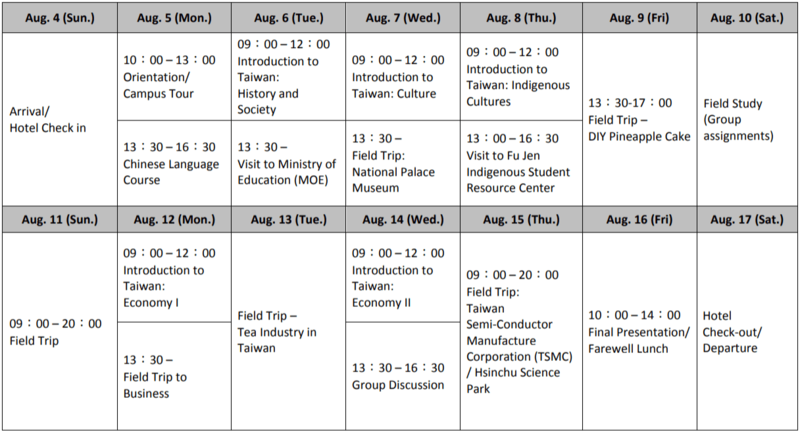 Field trips are included as an accompaniment to the lectures, so students can have an up-close view on the latest economic developments in Taiwan. The social/cultural component of the program introduces the history and society of Taiwan, as well as how Western culture has merged with more traditional cultures here. The topics covered include history, religion, and indigenous cultures. 30 international students from UMAP Member Countries. Costs associated with the courses, field trips, visits, and accommodation are covered by the organizers. Participants are responsible for arranging travel to and from Taiwan and for expenses such as health insurance, meals, commuting, and other personal expenses. Students who complete the entire program (i.e. all lectures and activities) will earn 4 credits (72 study hours) as well as a Certificate of Participation issued by UMAP Taiwan National Secretariat. Students who are currently enrolled in academic institutions participating in UMAP’s pledged institutions or whose Pledge of Agreement (PoA) is scheduled to be confirmed during 2019. TOEIC: overall Score of 650 or D. Score on another English proficiency test equivalent to the those mentioned above. English is the primary medium of instruction at their university/institution. Be willing to attend and participate in all lectures and activities included in UMAP Discovery Camp 2019. Be physically fit to travel and able to engage in all activities. Obtain a visa/permit to enter Taiwan if required. Purchase international health insurance in their home country which covers both illness and accidents. Step 2 – After receiving nominations, the UMAP Taiwan National Secretariat will notify applicants to complete the application process. Step 3 – The Taiwan National Secretariat will announce the list of successful applicants. Step 4 – Successful applicants will submit copies of their passport and overseas health insurance via email. Complete official transcripts from home university (i.e. all semesters). A recommendation letter from a faculty member of their home university/institution. The Taiwan NS reserves the right to adjust the schedule at any time due to weather conditions or events outside of our control.